Volkswagen is German for “the people’s car” and it is just the first of many unique names associated with the brand. The entire VW lineup is full of unique models with equally unique names. While many VW models are named with wind in mind, all of the names are very fitting for each specific vehicle. Read on to find out about Volkswagen model names and their meanings. Beetle — The Beetle is actually the first vehicle Volkswagen ever produced. Originally named “The Volkswagen,” the Beetle eventually adopted it’s current name based on it’s classic design. Golf — Volkswagen’s hatchback continues the wind motif with the name Golf, which is German for Gulf, a reference to the Gulf stream. EOS — The EOS, while not a reference to wind, is actually named after the Greek goddess EOS, the goddess of the dawn. CC — The Volkswagen CC is actually just an acronym for comfort coupe, which is a pretty good description of VW’s high-class sports car. Tiguan — The smaller of Volkswagen’s two SUVs is named Tiguan, which is a combination of the German words for Tiger and iguana. Touareg — VW’s larger luxury SUV is perfect to take anywhere, which is probably why it was named for the nomadic Tuareg people of North Africa. As you can see, not only the Volkswagen brand but all of its models have names that are as unique as the vehicles themselves. 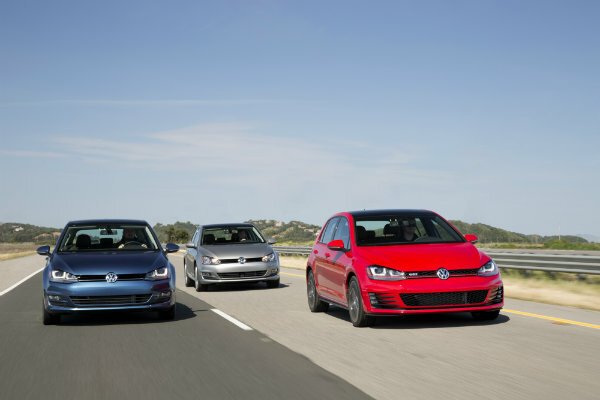 To find out more about all of these Volkswagen models and what they have to offer, you can feel free to contact our Van Nuys Volkswagen dealership. This entry was posted on Saturday, August 29th, 2015 at 9:37 pm	and is filed under For Fun. You can follow any responses to this entry through the RSS 2.0 feed. You can skip to the end and leave a response. Pinging is currently not allowed. Hi. Hope you can offer advice. I’m a retired VW mechanic (mostly air cooled), & recently I noticed a Golf in Cooma NSW (maybe a few years old), & it had a genuine looking badge on the back with a male first name (I think), like Fred etc. (as example), but although I was curious, I didn’t have time to write it down or take a pic. Any info would be appreciated. There are 3 Faults in this Article. 2. Im not 100% sure because if i google a German Synonym for Passat it says that those are the Cold Winds but the word is used rarlerly or not at all because i nevere heard of it. 3. The Tiguan is completly wrong and doesent mean Tiger at all. Tiger is Tiger in German just pronounced diffrent. And it also doesent mean Iguana. I wonder how you got to this information and why you didnt double check if its the Truth at all.